It’s been a roller coaster of a year -- one that a lot of people wished they could get off of. 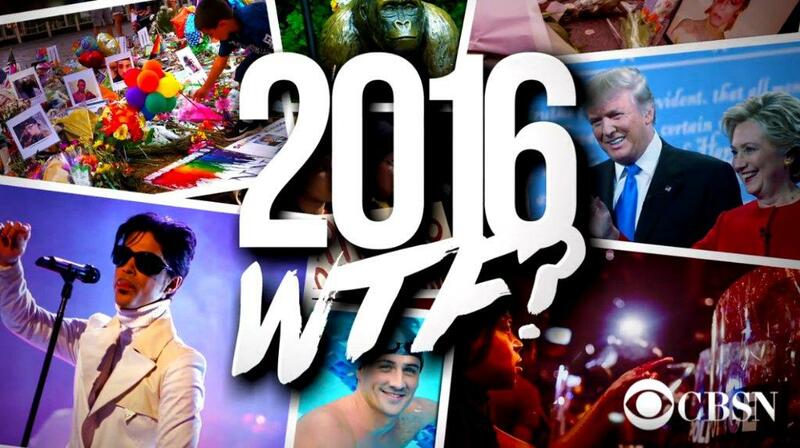 CBSN’s “2016 WTF?” reflects on the most stunning moments of 2016. Ten days into 2016, the world learned of David Bowie’s death. The following few months were marred by tragedies and public health crises, including the continued spread of the Zika virus, the Flint water crisis, the terror at a Brussels airport, and the death of Supreme Court Justice Antonin Scalia. Another icon suddenly passed away in April, when Prince died from an opioid-related overdose. Just one month later, the killing of a gorilla named Harambe to save the life of a young child became the subject of a heated internet debate. Another controversial topic of discussion was the sentencing of Brock Turner, who was given six months in jail after he was convicted of sexually assaulting an unconscious woman. In June, Muhammad Ali passed away after a long battle with Parkinson’s, the United Kingdom voted to leave the European Union, and the United States mourned after a mass shooting killed 49 people at a gay night club in Orlando. More heartbreak came in July, when the deaths of Alton Sterling and Philando Castile set off protests around the county, and five Dallas police officers were targeted and killed while protecting one of those protests. Then, the world rallied around Nice after a man radicalized by ISIS drove a truck into a large crowd celebrating Bastille Day, killing more than 80 people. Toward the end of the summer the Republican and Democratic parties each held their conventions. In August, a haunting image of a young boy after an airstrike in Syria showed the world the horrors of the civil war there. Later that month, Ryan Lochte’s lie about being robbed at gunpoint during the Rio Olympics became an international incident, and people across the globe were captivated by an iPhone app called Pokemon Go. By the time fall rolled around, Samsung Galaxy Note 7 phones were banned from planes, and Gary Johnson was facing backlash after asking “What is Aleppo?” on cable television. And as the election neared, lewd Access Hollywood tapes of Donald Trump were leaked. Just as the dust from the Access Hollywood tapes began to settle, FBI Director James Comey released a letter that reignited the controversy over Hillary Clinton’s email server 11 days before the election, though no charges were recommended. In November, the Chicago Cubs finally won the World Series, ending a 108-year title drought. One week later, Donald Trump won the U.S. presidential election. In the wake of the election, headlines on the prevalence of fake news and foreign interference dominated the headlines. Amidst all of the political headlines, legendary political journalist Gwen Ifill passed away. Tragedy struck again just at the end of the year, when a fire in an Oakland warehouse killed more than 30 people.